To kick off the ice cream chain’s 65th birthday, Baskin-Robbins, the world’s largest ice cream chain, is announcing the retirement of five signature flavors to its “Deep Freeze” to make room for even more flavors in the brand’s already extensive flavor repertoire. 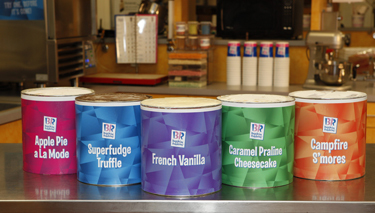 At Baskin-Robbins corporate headquarters, five classic flavors were heralded and officially retired as thousands of employees cheered them on as they headed to the “Deep Freeze.” The five retiring flavors include French Vanilla, Caramel Praline Cheesecake, Campfire S’mores, Apple Pie a La Mode, and Superfudge Truffle. The retiring flavors will be available only until supplies last.